On Friday the Treasury Department came out with their March Housing Scorecard with a Spotlight on the Chicago Housing Market for 14 area counties in 3 states. The headline of the report is that the Chicago housing market is more challenged than the nation as a whole and, while it showing some signs of recovery, it remains "fragile". During the decade spanned by the Census, new housing production exceeded household growth in the Chicago MSA; net annual housing unit growth at 1.0 percent was approximately twice the corresponding population and household growth rates. This excess construction contributed to an oversupply of housing and led to steeper price declines after the housing bubble burst. According to the Census Bureau, the number of vacant units in Chicago increased by an average of 13,900 units, or 7.7 percent annually during the 2000s, almost twice the national rate during the same period. 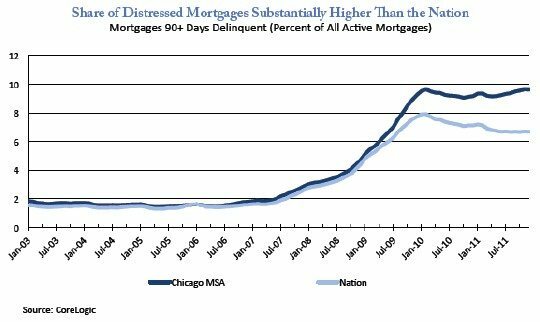 The share of distressed mortgages in Chicago is currently at 9.6 percent, matching its February 2010 peak level; in contrast, national rates have declined from a high of 7.9 percent in February 2010 to 6.7 percent currently. A partial explanation for Chicago’s higher share of mortgages at risk of foreclosure is the time it takes to complete a foreclosure in Illinois. According to Realty Trac, the average foreclosure processing time in Illinois, which uses the judicial foreclosure process, was 575 days in the fourth quarter of 2011 (fourth longest among states) while the national rate was 348 days. 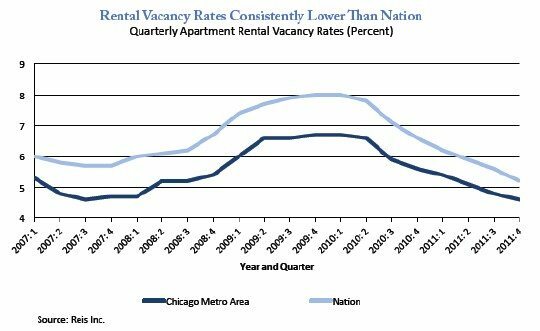 ...the overall apartment vacancy rate in Chicago was just 4.6 percent in the fourth quarter of 2011, down from 5.6 percent a year earlier and well below the current national average of 5.2 percent. You can also find a number of similar Chicago housing market statistics on our Web site that we keep up to date on a regular basis. 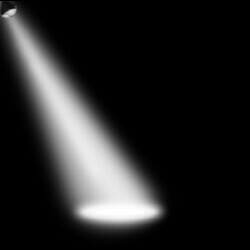 Does This Housing Report Have A Not-So-Hidden Agenda? The entire report is 5 pages long but the last 2 pages are basically a commercial for the efforts of the Obama administration to help underwater homeowners. Consider the following claim: "the Administration’s Neighborhood Stabilization Program (NSP) and Hardest Hit Fund have helped to stabilize the Chicago housing market." How would they know that? Or this claim: "NSP funds have helped save jobs. Each home purchased, rehabilitated and sold through the NSP program is the result of the efforts of 35 to 50 local employees." But the report also says that Chicago has been suffering from excess supply and these programs essentially put people to work creating a product that we apparently don't need. We could also put people to work making Pet Rocks but is this really a productive use of resources? Don't get me wrong, I just bought a house next door to an abandoned building that I'd like to see dealt with. However, I'd rather see it knocked down than fixed up. all i can add is anecdotal evidence. Just came back from a walk around the neighborhood where average home prices are ~$350K. There is a newly renovated/constructed home going for $600K (listed by Prudential Ripoff no less). When will builders (and sellers) learn that the person who can pay half a million dollars for a home, doesn't want to live in X neighborhood and the person who wants to live in X neighborhood cannot afford to pay half a million dollars for a home. Another reason for the distress in the market are property taxes. Don't know if that is mentioned in the report or not. The Chicago metro market has housing values that have decreased as much as 30%, while the taxes have either remained the same or increased. Sometimes on the margins that extra $40 to $50 dollar per month increase in tax can be the breaking straw. It has the power to change neighborhood. Unfortunately, with pension reform for public union employees becoming a reality, I do not see property taxes decreasing. This could be a mortal blow to the market. Chicago and Cook County could very well revert to ag land, as is Detroit. Once the city gets used to the money coming in there is no way they are going to spend less so the taxes have to stay the same. That's why you have to keep appealing your taxes because if you don't your taxes will go up.